The last 20 minutes in Croke Park last Sunday afternoon was very tough going for the Galwegians who had made the trip to Dublin support their team. The Galway fans near us in the Cusack Stand were almost watching the last few minutes through their hands. And when Adrian Varley was harshly black carded, and Paul Conroy followed him before the finish, the disappointment was complete and every Galway person in the place just wanted Conor Lane to blow it up and put an end to the anguish. While the supporters were rightly disappointed with the 3-13 to 1-10 defeat, the players, and team management who after working so very hard at getting things right for the past few months, will have been disconsolate and utterly dejected with their total "no-show". They will know, more than anyone, that they are capable of better than what they showed last Sunday and they unfortunately picked a really big day to have such a stinker of a performance. 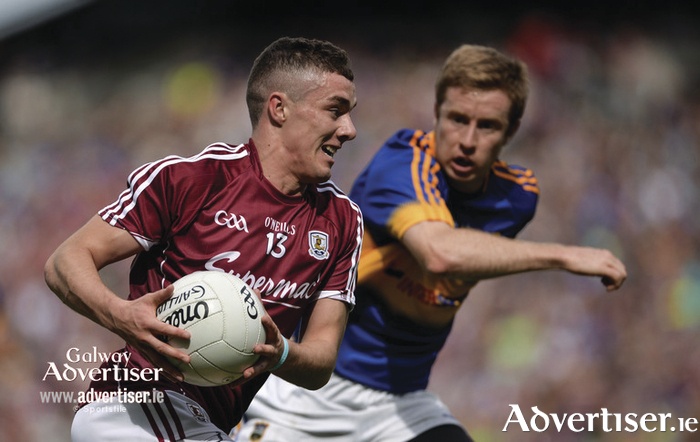 While Tipperary produced a very impressive display with the likes of Quinlivan, Sweeney, Acheson, O' Halloran, Fox, and Kiely really catching the eye - Galway made it far too easy for them to do so, by producing such a timid, lethargic, and underwhelming display. Unfortunately, there was no actual energy, intensity or work-rate from the majority of the Galway team. Barring perhaps Damien Comer and Danny Cummins, most of the rest of the team looked a bit flat and stale, and unable to compete with the Tipp players who really tore into the fray and dished out any big hits they could when they got the chance, as Gareth Bradshaw and Comer can testify to. Galway's central eight from Gary O'Donnell up to Johnny Heaney never really got to grips with their men. Paul Conroy and Tom Flynn who had been very impressive in the provincial campaign really struggled with Peter Acheson and George Hannigan. Conroy did hit a sweet point in the first half, and was key to creating Comer's well taken goal, however he never had the influence that Galway needed from him. Both Conroy and Flynn needed to have far stronger and bigger games if Galway were going to survive the Tipperary onslaught. The Galway half-forward line too was non-existent with all three men being replaced in the second half. The Galway full-back line was put under massive pressure from Michael Quinlivan and Conor Sweeeny who hit 3-5 from play between them. The fact that both those Tipp men were taller than any of the Galway full-back line was a major negative to contend with too, as highlighted by Sweeney's flicked goal. Galway should have tried to play a sweeper closer to their full-backs to offer them some protection and support, because they looked well beaten for the entire game and there was too much space in front of them which Tipp looked for and subsequently exploited. It was strange that Galway did not make any personnel changes until 47 minutes, considering the pressure they were under defensively. Cathal Sweeney was a loss with his shoulder injury as regards making a change. The other Galway substitute defenders will not have been pleased that they were not called upon despite the defence being porous for the full 70 minutes. Despite the heavy discontent following such a solid trimming at Croke Park, some of the criticism of the players, and management has been, as per normal in Galway, over the top. It is easy to slam dunk people and put the boot in when they are down, however, as no less a man than Aristotle pointed out - "There is only one way to avoid criticism. Do nothing, say nothing, and be nothing". This squad did win the Connacht title for the first time in eight years and that is a positive development. Last weekend was poor, however, Galway are still Connacht champions for 2016 and they have also blooded the likes of Wynne, Kyne, Power, Brannigan, and Kerin who will have learnt from their first season at senior level. In fact, all the squad and management team should learn a lot from last Sunday's heavy defeat. Some players may not be back for 2017, however, there are six or seven other players in the county who will hopefully commit to the cause next season and they would bring a new energy and freshness to the panel. The likes of Peter Cooke should benefit from another year of development too and he has the talent to provide options around the middle third in nine months' time. The squad and management will know better than anyone, without being told repeatedly this week, that they did not perform anywhere near to the standard that they would consider acceptable in a crucial championship game. No team has any chance of being good enough to win big championship games in Croke Park unless they go out onto the field of play and really compete and tear into the opposition. Galway did not do that at all last weekend and the first job the management team will have to try and do, is to try and figure out why.